How much does the Certified Cloud Professional (CCP) or Certified Cloud Architect (CCA) exam cost? Each exam attempt costs US$ 95. What’s is the time frame till I will receive my examination access code? After your payment transaction - an access-code/key will be emailed to you within two business days. If you do not receive a mail from us you should first of all check your SPAM folder. If you can't find any mail from us in the Spam Folder please contact info@cloud-institute.org. What is the score to pass the exam? To achieve the certifications, the exams must be completed with a passing score of 75%. Where you can pass the Certified Cloud Professional or the Certified Cloud Architect exam? All exams are online accessible tests. Each of these exams is a web browser-based test. You must answer 50 multi-choice questions. The available time is one hour. How can you be prepared for the exams? Besides our certificates are based on the consolidated findings of the "National Institute of Standards and Technology (NIST)" of the U.S. Department of Commerce, we strongly recommend to make your studies based on these "NIST Special Publications" at: http://csrc.nist.gov/publications/. Furthermore it is very helpful to check your knowledge with the Open Exam. In addition you might have a look at our Book Recommendations. In general we recommend working experience in at least one of the following areas: Enterprise Cloud Computing technology, Services orientated Architecture design or development, Cloud-related IT services, Application- and/or Storage- centric services. 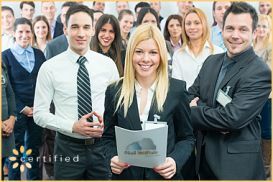 How to renew your Certified Cloud Professional or Certified Cloud Architect Certification? The CCP and CCA certification is valid for two years starting from the original certification date. Every two years, you have to renew. You can renew your certification conducting the “Renew Certification” exam. It is $75 for two years. Short time before your certification is going to expire, you will receive an E-Mail from us containing a link to the "Renew Certification" exam. On this Frequently Asked Questions page, we will be glad to help you by presenting the answers of your most probably questions. We hope the answers we provide here will support you to make the best Cloud Computing certification program choice in your own Cloud Computing journey. If you still have some further questions, please don’t hesitate to contact us from info@cloud-institute.org e-mail address.